The BIO International Convention is the industry conference for those in or doing business with the biotech industry. MCEDC’s Lynne Stein Benzion, Director of Business Retention and Expansion, is a veteran of several BIO conferences and offered her reflections on this year’s event, which took place June 19-22 in San Diego and drew more than 16,000 industry leaders from 48 states, the District of Columbia, Puerto Rico and 73 countries. Benzion noted that representation from Montgomery County was especially strong: more than 50 organizations, including corporations, nonprofits and government agencies were represented, and nearly all the presentations from the State of Maryland had speakers or other involvement from companies and organizations from MoCo. “You could actually feel the excitement in the air and in the conversations people were having,” said Benzion. So what was she hearing from people who came to the MCEDC booth? People are attracted to MoCo because we’re home to the FDA, NIH and many other federal agencies. Attendees were excited about MoCo resources and support: the opportunity to partner with the FDA at White Oak; the Innovation Centers; the facilities and build-to-suit opportunities at Pinckney Innovation Complex at Montgomery College (PIC MC); and the assistance with tech commercialization from BioHealth Innovation (BHI). Access to three international airports is a large draw, especially since biotech is a global industry. Our mass transit is an appeal and a big differentiator from many U.S. cities. This appealed not only to international attendees but also to companies looking to attract millennials, many of whom do not own cars. MoCo has strong name recognition: the perception in the U.S. and around the world is that we have a strong biotech industry. In addition to MCEDC’s presence at the 2017 BIO International Conference in San Diego in June, Montgomery County as a whole had strong representation. MOCONNECT recently spoke with two show veterans: Lily Qi, assistant chief administrative officer for economic and workforce development with the Office of the County Executive for Montgomery County, and Martha Schoonmaker, CEcD, executive director of the Pinkney Innovation Complex for Science & Technology at Montgomery College (PIC MC). The executives offered their insights into what made this year’s event such a success for the county. MOCONNECT: What about this year’s left the biggest impression on you? Qi: Maryland, and specifically Montgomery County, had a significant presence; we had one of the largest pavilions on the exhibit floor. We also found tremendous value in being able to connect with our neighbors throughout the industry. I thought one of the best events were the Maryland Tech Council presentations, which featured panel discussions by Maryland companies, and many from Montgomery County. It gave all of us the opportunity to hear where the market is headed both nationally and internationally. Countries like China, Taiwan, and India, for example, have a big appetite for our R&D. Schoonmaker: This is the one time of the year that everyone in the life sciences community comes together. This year’s convention reinforced our standing in the life sciences sector and solidified our resolve to become No. 3 in life sciences in Maryland by 2023. 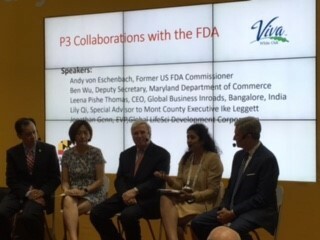 A lot of what is happening in life sciences is germinating in Montgomery County, and BIO helped us tell our story, demonstrating to other regions that we are a global county. MOCONNECT to Qi: What was the biggest impact Montgomery County left on the convention? Qi: We are the biocapital of the region and home to the NIH and FDA. No one else can make that claim. You almost don’t have to say anything else. Also, one of the main reasons I attended BIO was to promote our many different location options for the life sciences industry such as PIC MC, Johns Hopkins’ Belward Research Campus and White Oak, which is an important project for East country growth and revitalization. Part of my mission was to see what kinds of companies might be interested in being located on the campus and next to the FDA, and I discovered there is a lot of interest. In fact, I learned that a company in Virginia that I met at last year’s convention will now have a presence at White Oak. MOCONNECT to Schoonmaker: What does exhibiting at BIO offer PIC MC? Schoonmaker: The reason we exhibit at BIO is so that local and global companies alike will know about all the assets our campus has to offer the life sciences industry. We really are unique when it comes to community colleges. We are actively seeking companies to locate on our campus and are a very suitable location for life sciences companies. We are close to the nation’s capital and 18 federal agencies, we are able to connect companies with talented students, and we offer ongoing workforce development courses, which are all assets that attract companies. We are also very industry driven, and what better way for a company to access current and future workforce than by being located on a campus that trains and educates students real time. Qi: This was one of the best BIO conventions I have attended, and it’s important that we continue to have a presence at this event. Schoonmaker: At BIO, we are team and there to support each other. We’re there to make a statement to the biotech community, “Look at us; Montgomery County is the place to be!"